Skookum Child Indian Doll; blue, orange, cream trade blanket; necklace; cloth moccasins; Height, 8" Condition, good. Handsome male skookum doll with trade blanket, bead necklace, headband, green feather, and painted leather moccasins; 10 1/2"; Condition excellent. 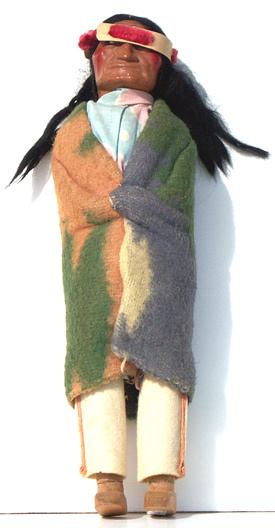 Large Skookum Female Indian Doll with burgundy/olive/tan trade blanket; Orange patterned dress; headband and feather; papoose; cloth moccasins; Height, 13"; Condition, excellent!